If you've met Nate, you know he stutters. He started around the age of 3, and never stopped. We thought he would outgrow it over time, but instead it got suddenly worse about 6 months ago. 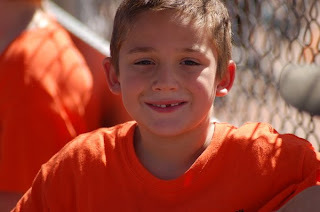 (He turned 7 in May) We had discussed it with his pediatricians over the years, and they agreed that he would likely out grow the stutter, and we should watch it. Last spring, he suddenly began stuttering more often and added a physical lunge of his head while stuttering. At this point, we knew we needed to find outside help. When the school year started this fall, I called over to our local neighborhood school and inquired about the process. It took me a few tries to get to the right people, but once I did the process moved along -- as quickly as it can in a bureaucracy. The speech pathologist we've been meeting with is a very sweet, kind woman who has done everything to make Nate feel comfortable and understand more about his stuttering. We're still in an evaluation period, so we don't have a plan yet, but that should happen in the next couple months. I was worried that we would be treated differently because we home school, or they would accuse us of delaying treatment because he wasn't in a traditional school setting. Instead, everyone we've worked with has been wonderful. We haven't encountered any negative home schooling vibe, but instead we've been praised for the efforts we have put forth and the different ways we've handled his stuttering up to this point. That has been a relief, as I had beat myself up enough. Scientists don't know why people stutter, and that can be frustrating for people who stutter. There are plenty of myths out there, but none are true - - the fact is that something happens and there is no specific trigger or reason that some people stutter. Telling kids to slow down doesn't help -- being patient and allowing them to finish their statement does. They know they're stuttering, and don't need to be reminded of the fact. Nate's a kind-hearted, intelligent boy with the need to touch and feel everything around him. He's not afraid to speak in public, and I'm always grateful for those strangers that are patient with him and let him finish speaking. Sometimes he does struggle too much, but I won't step in unless he indicates he'd like me to intervene. In fact, there are plenty of times when he is more willing to converse than his older brother, who has no speech problem! He gets a kick out of the fact that James Earl Jones stuttered -- I mean, how much cooler can you get than Darth Vader? There are plenty of famous people who stutter, but the most easily recognized for Nate was Darth Vader. We found that information at the Stuttering Foundation's website, and while the website was a little difficult to navigate -- the information provided was wonderful. I ordered a handful of pamphlets and books that were extremely informative and not expensive. Nate especially appreciated the book written by a young girl about a child that was made fun of because of her stutter. I really appreciated that some of the books (including the one Nate enjoyed) are available for download at no cost. I haven't ever really talked about Nate's stutter -- other than with him, his dad and our pediatrician. It's always just been part of him, and we haven't felt the need for much discussion. As we move into speech therapy, I'm sure that I will write about it sometimes. We're discussing it more at home now, and paying more attention to the different kinds of stutters he has. We're learning more about it, and I'm eager to learn new techniques to help him lessen his stutter. The team I'm working with right now is committed to teaching me all I need to know in order to help him, and I'm grateful for them. Sounds like you've found some great resources for help in this area. I think it's awesome that Nate is not shy and has the confidence to speak in public. Your wisdom in allowing him to finish sentences, without prompting, have probably helped lead to that. I'll be reading future posts with interest, to see his progression. Nate is a great kid and he is full of confidence. I know that he will get past this. Maybe Nate can be the next iconic person who once had a stutter and inspire other little boys? He is Nate the Great.